Citation Information: J Clin Invest. 2010;120(7):2423-2431. https://doi.org/10.1172/JCI41649. Neutrophils are a major component of the innate immune response. Their homeostasis is maintained, in part, by the regulated release of neutrophils from the bone marrow. 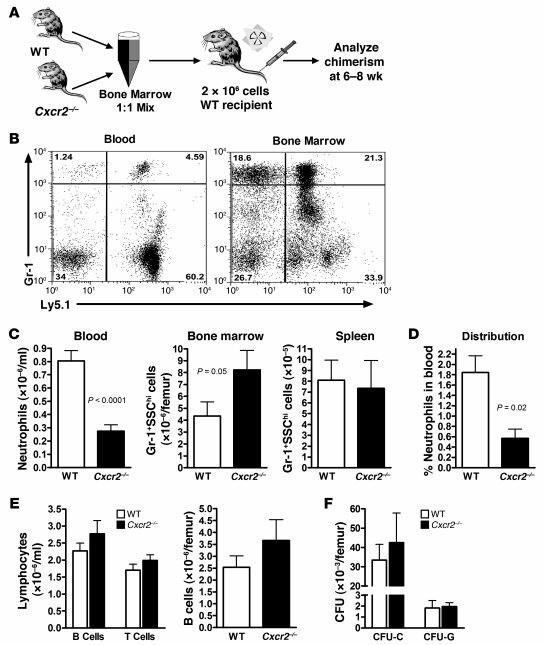 Constitutive expression of the chemokine CXCL12 by bone marrow stromal cells provides a key retention signal for neutrophils in the bone marrow through activation of its receptor, CXCR4. Attenuation of CXCR4 signaling leads to entry of neutrophils into the circulation through unknown mechanisms. We investigated the role of CXCR2-binding ELR+ chemokines in neutrophil trafficking using mouse mixed bone marrow chimeras reconstituted with Cxcr2–/– and WT cells. In this context, neutrophils lacking CXCR2 were preferentially retained in the bone marrow, a phenotype resembling the congenital disorder myelokathexis, which is characterized by chronic neutropenia. Additionally, transient disruption of CXCR4 failed to mobilize Cxcr2–/– neutrophils. However, neutrophils lacking both CXCR2 and CXCR4 displayed constitutive mobilization, showing that CXCR4 plays a dominant role in neutrophil trafficking. With regard to CXCR2 ligands, bone marrow endothelial cells and osteoblasts constitutively expressed the ELR+ chemokines CXCL1 and CXCL2, and CXCL2 expression was induced in endothelial cells during G-CSF–induced neutrophil mobilization. Collectively, these data suggest that CXCR2 signaling is a second chemokine axis that interacts antagonistically with CXCR4 to regulate neutrophil release from the bone marrow. Cxcr2–/– neutrophils are selectively retained in the bone marrow of mixed chimeras. (A) Generation of mixed chimeras. Bone marrow cells from WT and Cxcr2–/– mice (expressing Ly5.1 and Ly5.2, respectively; 1 × 106 cells from each) were mixed in a 1:1 ratio and transplanted into lethally irradiated congenic WT recipients (expressing Ly5.1). Mice were analyzed 6–8 weeks after transplantation. (B) Representative dot plots showing the contribution of WT and Cxcr2–/– cells (with and without Ly5.1, respectively) to neutrophils (Gr-1hi) in the blood and bone marrow. (C) Quantitation of mature neutrophils (Gr-1hiSSChi) in the blood, bone marrow, and spleen. (D) NDI was calculated as described in Methods to estimate the percentage of total body neutrophils in the blood. (E) Number of B lymphocytes (B220+) or T lymphocytes (CD3+) in the blood (left) and B lymphocytes in the bone marrow (right). T lymphocyte chimerism was assessed 6 months after transplantation (n = 3). (F) Number of WT or Cxcr2–/– CFU in culture (CFU-C) or CFU-granulocyte (CFU-G) in the bone marrow (n = 3). n = 27 (blood); n = 6 (bone marrow and spleen) from at least 3 independent transplantations, unless otherwise indicated.